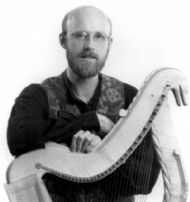 Bill is the current teacher-in-residence with Ardival Harps in the Highlands of Scotland. He was awarded the title 'United States National Clarsach Champion' in 1992, and now has a growing international reputation as a player and researcher of the ancient and traditional harp music of Scotland, Ireland and Wales. He has recorded with ASV, CMF, Dorian, Greentrax, Maggie's Music, Rhiannon, Rota and Temple; and his solo CD of historical Welsh harp music is on Dorian Recordings. He has taught at the Edinburgh Harp Festival and the Highland Harp Festival, and is often invited to lead workshops in Britain, Europe and the United States. His teaching covers a wide range of subjects; arranging for small harps, using fingernail technique to play wire-strung harps, and introducing repertoire from medieval, renaissance and traditional sources. Bill is an excellent teacher of beginners and players alike. Course days begin at 9.30 am and conclude at 3.00 pm, leaving time for students to explore the area or to practise. Tuition: £195, including lunch and refreshments. After the success of our extended five day wire harp course in 2006 our 2007 course will again run for 5 days. All players with some previous instruction in wire-strung technique are welcome. We will study traditional and historical harp music from Scotland and Ireland. The course begins with an evening meal on Thursday evening at 7.00 pm and concludes on Tuesday afternoon at 3.00 pm. Tuition, room & board £430 for the 5 days. Days typically begin with a technique class at 9.30 am. After coffee, students develop group arrangements as new repertoire is introduced. The lunch break is a time to relax over a delicious home-cooked meal and to take a short walk. During the afternoon session, we examine various topics in playing different kinds of harps, or music from different eras. We conclude at 3:00 pm, leaving late afternoons for walks in the wooded countryside or for practicing on one's own. Evenings are flexible, giving time for social gatherings, informal playing or attending locaI events. Beginners' courses are non-residential. There is a wide range of good quality accommodation close by in Strathpeffer. This includes hotels, B&B and self catering cottages. Cost of B&B will range from £20 per night. Local hotels serve bar meals and dinner to non-residents. The course fee is £195, which includes tuition, refreshment and lunch each day. The courses will be confirmed when four students have paid a deposit. Deposits of £100 per person should be made payable to Bill Taylor and sent to: Ardival Harps, Orchard House, Castle Leod, Strathpeffer, Ross-shire, Scotland. IV14 9AA. Tel/Fax: +44 (0) 1997 421260. Beginner's Courses will be confirmed when four people have paid deposits. The maximum number for beginners' courses is nine. This autumn we offer a residential course for wire-strung players on the beautiful Seaforth Highland Country Estate, between Strathpeffer and Conon Bridge. The course will examine historical and traditional music from Scotland and Ireland, including dance tunes, traditional airs and courtly songs. Players of all levels are invited. The Seaforth Estate is the land where Brahan Castle once stood -- one of the ancestral seats of the Clan MacKenzie, and also home of the 17th-century Brahan Seer. We will be based in an old stone farmhouse, situated within walking distance of the River Conon and allowing comfortable woodland and riverside walks. As with last year's successful course in Cromarty, Zan will be our cook. The course fee of £340 includes tuition and accommodation with full board. Tuition with lunch, but without accommodation or evening meal, is £195. Deposits of £100 per person should be made payable to Bill Taylor and sent to: Ardival Harps, Orchard House, Castle Leod, Strathpeffer, Ross-shire, Scotland. IV14 9AA. Tel/Fax: +44 (0) 1997 421260. The wire-strung course will be confirmed when five people have paid deposits.